Published by WM. M. Cook, Sag Harbor, L.I. N.Y. Illustrated Post Card Co., N.Y. 5869. Published by WM. M. Cook, Sag Harbor, L.I. N.Y. 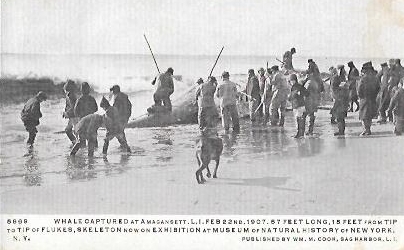 Illustrated Post Card Co., N.Y. 5869., “Whale Captured at Amagansett. L.I. 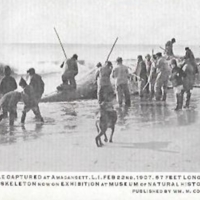 Feb 22nd, 1907 ,” Hofstra University Library Special Collections: Digital Collections, accessed April 21, 2019, https://omeka.hofstra.edu/items/show/1473.